" Messages with the Masters " Pdf books, Shellee-Kim, part 3. 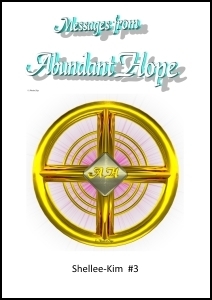 By AbundantHope, Pdf made by Christ.
" Messages with the Masters " Pdf books, KiboDabi: part 12.
" Messages with the Masters " Pdf books, KiboDabi: part 11.
" Messages with the Masters " Pdf books, KiboDabi: part 10.
" Messages with the Masters " Pdf books, KiboDabi: part 9, update.
" Messages with the Masters " Pdf books, Benjamin part 1, update.
" Messages with the Masters " Pdf books, Shellee-Kim, part 2, update.
" Messages with the Masters " Pdf books, KiboDabi: part 8.
" Messages with the Masters " Pdf books, KiboDabi: part 7.
" Messages with the Masters " Pdf books, KiboDabi: part 6 update.
" Messages with the Masters " Pdf books, (Hazel) Hazel Sinanan: part 5, update.
" Messages with the Masters " Pdf books, Joyce, part 1.
" Messages with the Masters " Pdf books, Leonette: part 2 - update.
" Messages with the Masters " Pdf book: Jess Anthony, part 3 - update.
" Messages with the Masters " Pdf books, Spiritual Nuggets by the Masters: part 4, update. Vincent's Higher Self Teaching Reports, Part 1, update.
" Messages with the Masters by Others" Pdf books, part 6, update.
" Messages with the Masters " Pdf books, KiboDabi: part 5, update.
" Messages with the Masters " Pdf books, Bela: part 1-Update.